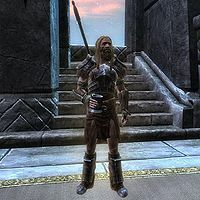 Since he is the first known human to transcribe Nordic speech using Elven principles of writing, Ysgramor is credited with being the first human historian. Because of his exploits, he is known as "the first Harbinger, the first Man, [and] the bringer of Words", and the modern-day Companions still revere him as their only true leader. His progeny ruled Skyrim until 1E 369, when the death of King Borgas brought an end to his direct line of known heirs. However, his bloodline survived, and he is still believed to be the wellspring from whom all Nordic kings are descended. Much of Ysgramor's life is clouded by myth and poorly kept records. It is suspected that Ysgramor is credited with the deeds of several early Nordic kings. Most myths associated with him have Herma-Mora, the "Demon of Knowledge", as the antagonist. Apparently, some historians have misrepresented Ysgramor as being the leader of the first large group of human settlers from Atmora, when in fact he was merely following what was already a long-established tradition of migration. During his voyage to Tamriel with his Five Hundred Companions, Ysgramor lost his son Yngol to the "sea-ghosts" (likely an ancient, superstitious term for the dangers in the Sea of Ghosts), and Ysgramor braved a storm to search for him in the treacherous waters. When Yngol was found dead, Ysgramor wept with grief and killed a "dozen dozen beasts" in Yngol's honor. Ysgramor ordered that a great city be built south of Yngol's burial place so that he could gaze at it from his palace. The great city came to be called Windhelm. Ysgramor's death was met with great sorrow and mourning among his kin, and the news quickly spread across Tamriel. Although a grand tomb was built for him beneath Windhelm in preparation for his passing, Ysgramor instead chose to be buried with his most trusted generals in a barrow on the northern shores of Skyrim, facing towards Atmora. His son Ylgar subsequently took up the mantle of leadership. In death, Ysgramor journeyed to the Hall of Valor in Sovngarde, where he continued to watch over the Nord people and the Companions. Calixto's House of Curiosities in Skyrim claimed to have Ysgramor's Soup Spoon on display. This page was last modified on 17 January 2019, at 14:58.